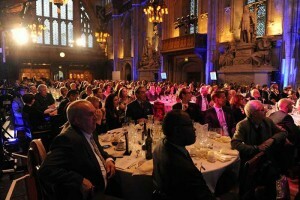 Last weekend, White Light proudly sponsored the UK Theatre Awards, presented Sunday at the historic Guildhall in Central London. The annual awards ceremony, organised by the Theatrical Management Association, celebrates the impressive individual and collective achievements of the nation’s thriving theatre sector. It is the only ceremony of its kind to recognise work from throughout England, Scotland, Wales, and Northern Ireland. White Light has long been a supporter of the TMA and its award ceremony, supplying lighting equipment and services to the event for several years before becoming an official sponsor of the UK Theatre Awards in 2012. White Light continues to supply lighting for the event in addition to its sponsorship. White Light managing director Bryan Raven commented: "We are happy to support the TMA and the UK Theatre Awards. Recognising and promoting the great work of regional theatres is a vital part of strengthening the cultural sector and ensuring it thrives in all areas of our country. Congratulations to all of the winners and everyone at the TMA for another successful event!" The big winner at Sunday’s awards was Sheffield Theatres who took home four awards including Best New Play for Mike Bartlett’s Bull, Best Musical Production for This is My Family and Best Touring Production for The Full Monty. Other highlights included the My Theatre Matters Award for Most Welcoming Theatre, which went to The Bike Shed in Exeter, and The Stage Award for Outstanding Contribution to British Theatre, which went to theatre legend Simon Callow.